The Knights struggled in a never-ending battle to contain USF’s offense as senior quarterback Quinton Flowers rushed for 102 yards and a touchdown, while throwing for 503 yards and four touchdowns. But UCF sophomore quarterback McKenzie Milton didn’t let his opponent get to him, rushing for 56 yards and a touchdown, while throwing for 373 yards and four touchdowns as well. Each quarterback only had one interception throughout the night, with Flowers taking sacks three times compared to Milton’s zero. 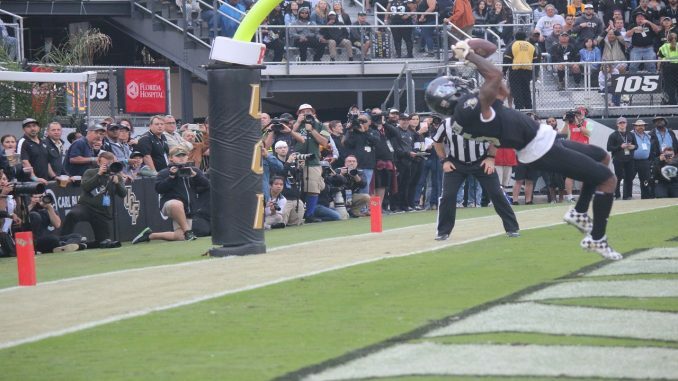 Sophomore receiver Dredrick Snelson had two touchdowns on the night, but his most important came on a 45 yard bomb down the field to put UCF up 35-34 on USF with 7:33 left of the game. Sophomore receiver Gabe Davis and sophomore running back Adrian Killins Jr. also had scores on the night. But, it was true freshman receiver Otis Anderson who came up clutch with a quick run into the endzone to give the Knights a 42-34 lead with 2:21 left in the game. The Bulls however, were not phased as they responded almost immediately with an 83 yard passing play from Flowers, tying the game at 42. Overtime seemed imminent, but junior cornerback Mike Hughes, who had UCF’s one interception, had a different idea. Hughes received the kickoff, cut left and right, and never looked back. The junior took it back 95 yards for the touchdown to give the Knights a 49-42 lead with 1:28 left in the game. USF had a chance to tie, but fumbled on its final drive. It was senior linebacker Shaquem Griffin who recovered the loose ball. The Knights are undefeated to finish the regular season for the first time in program history. They face off with Memphis next Saturday for the AAC Championship.